The last GE Moore Lecture of 2016 focuses on ‘Belief, Doubt and Atheism in the Age of Alleyn, Marlowe and Shakespeare’. 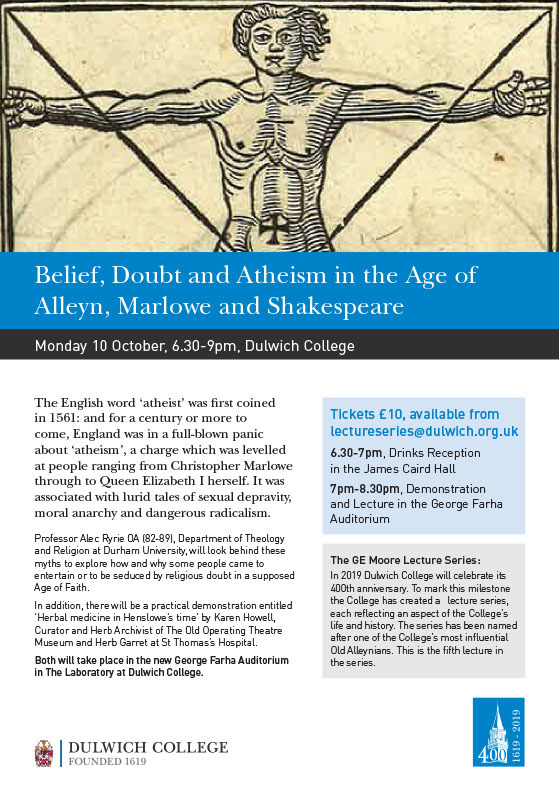 Taking place in their newly opened George Farha Auditorium in The Laboratory the Lecture focuses on how lurid charges of ‘atheism’ threatened to undermine the very moral fabric of Elizabethan society with even the Queen herself coming under the suspicious eye of the Church. Professor Alic Ryrie OA (82-89) will give this lecture and share his thoughts on how the bedrock of religious certainty in the ‘Age of Faith’ was shaken to its very core. The Lecture is complimented by a practical demonstration of ‘Herbal Medicine in the time of Henslowe’ by Karen Howell from the renowned Old Operating Theatre Museum and Herb Garret, one of England’s oldest herb garrets dating from 1703 and a fundamental part in the working of St. Thomas’s Hospital from that time. Please email lectureseries@dulwich.org.uk for ticket information and bookings.